Manufacturer and Inventor, London, Middlesex, UK, page 20. December 18, 1889. CONTINUOUS CURRENTS FROM ALTERNATING CURRENTS.--The problem of obtaining continuous currents from alternating is one that has received not a little attention, and various solutions have been offered on both sides of the Atlantic. 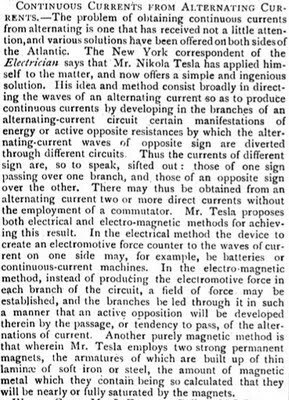 The New York correspondent of the Electrician says that Mr. Nikola Tesla has applied himself to the matter, and now offers a simple and ingenious solution. His idea and method consist broadly in directing the waves of an alternating current so as to produce continuous currents by developing in the branches of an alternating-current circuit certain manifestations of energy or active opposite resistances by which the alternating-current waves of opposite sign are diverted through different circuits. Thus the currents of different sign are, so to speak, sifted out: those of one sign passing over one branch, and those of an opposite sign over the other. There may thus be obtained from an alternating current two or more direct currents without the employment of a commutator. Mr. Tesla proposes both electrical and electro-magnetic methods for achieving this result. In the electrical method the device to create an electromotive force counter to the waves of current on one side may, for example, be batteries or continuous-current machines. In the electro-magnetic method, instead of producing the electromotive force in each branch of the circuit, a field of force may be established, and the branches be led through it in such a manner that an active opposition will be developed therein by the passage, or tendency to pass, of the alternations of current. Another purely magnetic method is that wherein Mr. Tesla employs two strong permanent magnets, the armatures of which are built up of thin laminae of soft iron or steel, the amount of magnetic metal which they contain being so calculated that they will be nearly or fully saturated by the magnets.